We Can Help You Recognize the Signs of Termites on Your Home Before Things Are Beyond Repair. When it comes to repairs to your home, one issue can be attributed to a tiny insect – termites. These pests have a voracious appetite for wood that can lead to major problems and leave you with costly repairs. There are several telltale signs that your home has termites setting up residence and are dining on it every day. The following are a few things to look for when doing a visual inspection. – Holes: Check wood fittings around doors, windowsills, decks, steps, wood paneling, wood floors, doors, or any other wood-based structure for tiny round holes about the size of the head of a nail. – Cracks: Check all areas for cracks in the wood. Termites eat from the inside out, so instead of holes you may see a series of dry cracks and crevices. Wood that has been eaten by termites is easy to puncture. You can also tap it. If it sounds hollow, most likely termites have been chewing away. – Droppings: Check around wood areas for a fine powdery substance that resembles sawdust. This fine dust may be droppings from drywood termites. 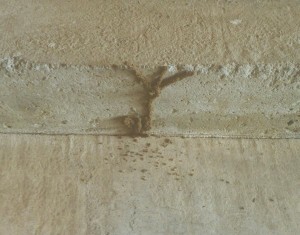 – Mud tubes: If you see small tunnels, these are termite subways into your home. If you think your home is at risk, our NJ pest control company can eradicate a termite infestation. For an inspection, contact Allison Pest. Professional technicians at our NJ pest control company are standing by. Termites are usually seen more often when it’s warmer out, so what happens to them in winter? Do these bugs die off as other insect species do, or do they manage to survive the cold in hibernation? Termites are able to get through the winter months without hibernating, so it’s important to watch for them and get help from the pest control experts in Wall NJ if needed. Termites are typically more active during the warmer part of the year, so it’s easier to spot them. You might see termites outside your home, especially if you have wood piles nearby. You might also see them inside your home when they come out of their nests. During winter, you’re not likely to see termites, but that doesn’t mean they hibernate. In fact, these bugs stay busy throughout the year. 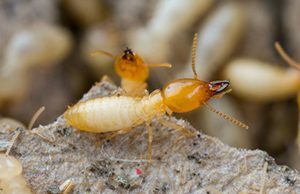 When it gets cold out, some termite species dig deeper and deeper underground. This provides them with a warm place to shelter until spring. If you see any evidence of these bugs in your home in winter, it’s essential to have infestations handled right away to prevent wood damage. If you notice signs of termites in your home this winter, please contact Allison Pest Control for help. Our pest control Wall NJ experts can get rid of termites in your home before they’re able to do serious damage. When termites get into your home, they can cause a tremendous amount of damage that costs a lot to repair. In addition to having NJ pest control services help you prevent these pests from getting in, you should also make sure you’re not making it easier for termites to invade. Having gutters that are clogged with leaves and other types of debris means that your home has poor drainage. As water builds up in your gutters instead of flowing out of them, termites can make their way into your home through your insulation. If you have tree stumps or other sources of dead or rotting wood on your property, it’s important to get rid of them. This type of wood attracts termites, which increases the risk of having them find their way into your home. If you have a fireplace, store wood for it away from your home’s exterior. Storing wood right next to your home provides termites with easy access to it. Termites can gain access to your home by crawling on branches and leaves that are right up against your home’s exterior. Keep trees close to your house trimmed to prevent this. If you need NJ pest control services for termites, contact us for help. At Allison Pest Control, we offer effective termite control for NJ homeowners. Termites are among the most dreaded pests that homeowners deal with. These wood-eating insects are one of the top reasons for hiring Monmouth County pest control services. Despite the trouble they cause, though, termites are actually fascinating bugs. Researchers haven’t fully determined just how long termites have been around. Some termite fossils date back to the early Cretaceous period, which was 145 to 166 million years ago. However, scientists also have reason to believe that termites have been around since the early Jurassic period, which occurred from 145 to 201 million years ago. Either way, termites have been here for a very long time compared to humans and other mammals. Scientists have found evidence that termites are close relatives of wood-eating cockroaches. Some researchers have even argued that termites should be considered a highly specialized type of wood-eating cockroach. 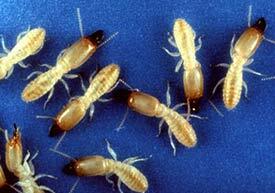 Just like their cousins, termites are widespread and have managed to form colonies in many parts of the world. In fact, these pests are found on every continent except Antarctica. These pests are typically found in warmer climates throughout the world. Termites can do a lot of damage in a short amount of time. If you have these pests in your home, contact us for Monmouth County pest control services. At Allison Pest Control, our experts will eliminate termites from your home safely and efficiently. Termites and ants are among the most common types of bugs that Monmouth County pest control services deal with. Both can cause damage to homes, but they don’t do so together. In fact, ants and termites are natural enemies and don’t get along at all. Scientists studying their behavior have found something fascinating about this rivalry. When ants and termites get into fights, there are bound to be some injuries. While scientists think that ants don’t pay much attention to injured comrades, they’ve recently found that one species does. Matabele ants are actually willing to rescue injured worker ants during fights with termites. These ants release a pheromone that sends out a message to nearby ants that one of their own has been hurt. The injured ant curls up to protect itself while waiting for rescue. 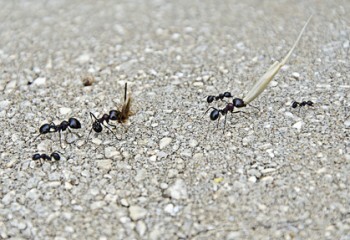 Other ants carry the injured ant back to the nest. Why do these ants take time to rescue injured workers and bring them to safety? Scientists speculate that this allows the species to continue having a larger colony than they would if injured ants were left behind in fights. If you have termites or ants in your home, give Allison Pest Control a call. Our Monmouth County pest control services can help eliminate these pests from your home before they cause serious damage. Termites – Make Sure You Don’t Have Them! No homeowner wants to admit that termites are a possibility, but the fact is that one in five NJ homes have these pests. That means you have a 20 percent chance of having a termite infestation this year. One of the most common types of termites to invade NJ homes is the Eastern subterranean termite. This termite, which is as tiny as a rice grain, is able to get into small cracks in homes in order to feed on wood. Keep in mind that it doesn’t take long for these termites to cause a significant amount of damage. That’s why it’s important for homeowners who suspect that they have termites to hire Monmouth County pest control services. 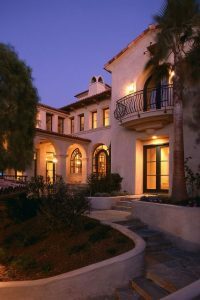 Termite treatments typically involve using bait systems, exterior liquid barriers or a combination of both. NJ homeowners should leave this type of work to professionals, since it requires following specific techniques. Otherwise,the treatments might fail to work altogether and the termites will easily come back and invade again. Allison Pest Control experts have the knowledge to ensure that termite bait systems and liquid barriers are applied correctly. This helps get rid of termites that are present and lowers the risk of having others invade. If you have termites in your home, our Monmouth County pest control services can help. Contact Allison Pest Control to learn more about our termite treatments.